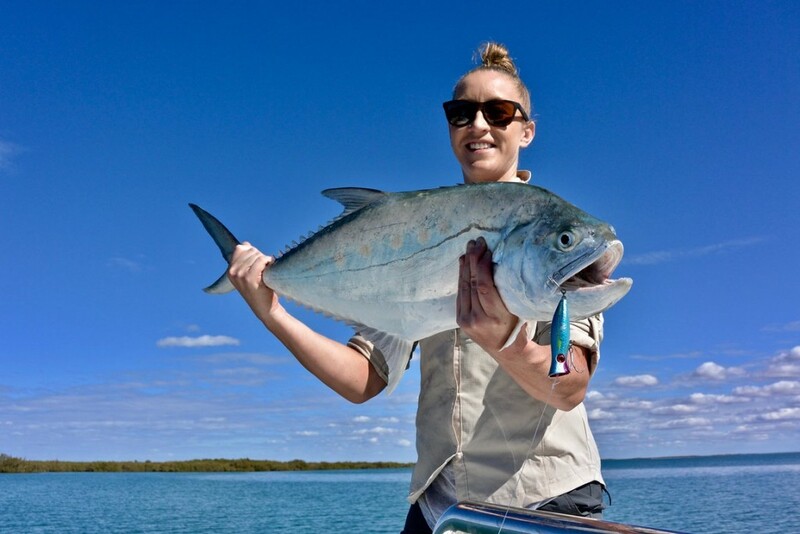 The flats are home to many sought after prized target species such as Permit, Queenfish, Giant Herring, Blue Bastards, Golden Trevally, Barramundi and a host of other species. Whilst out in Exmouth Gulf the possibilities are endless. From casting to surface feeding Longtail and Mack Tuna, to trolling for Mackerel and other inshore pelagics, to jigging for Cobia, Coral Trout, Golden Trevally and a host of other hard pulling reef species. In October vast schools of bait move into the Gulf followed by packs of Sailfish. This fishing can be very exciting with sight casting to free swimming Sailfish or trolling teasers and presenting a bait or fly to a teased up Billfish. The Murion Islands, situated at the mouth of the Gulf, provide great sport for popper and stick bait fishing for huge Giant Trevally, Red Bass, the aerobatic Queenfish, Mackerel, Coral Trout, Green Jobfish, and many more.